If you are here, I am guessing you are interested in buying a painting! I'd like to make this as easy for us as possible and there are several ways of going about it. All of the paintings on this website under "Available paintings" are for sale. I use a different provider to sell my art through a website called Daily Paintworks (DPW). Easy to use, great to peruse, if you click on any of my available paintings you will be taken to the page where you can buy direct through DPW. If you purchase through DPW, I will be notified and will ship your artwork to you asap! I also have paintings available through Art Plus Gallery in West Reading. If you live in the area (Reading, PA) you are encouraged to visit the gallery at 604 Penn Ave. in West Reading and can purchase one of my paintings through them. In any case, visit their website to see amazing work from 20 + Berks county artists! 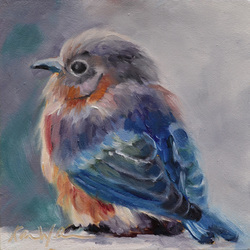 Shipping - $15.95 for domestic shipping and handling for my 6” x 6” framed paintings. Larger paintings will require an additional fee. I use the U.S. Postal Service Express Mail service which arrives in 2 - 3 days. I will send you a USPS tracking email once the painting has shipped so you will know when to expect your delivery. My paintings are shipped worldwide, personally packaged and fully insured.